For the purpose of this article, the term “hacker” 1) refers to automated systems which attempt to login to your Synchronet TCP/IP servers and services using common, well-known, or randomly selected credentials (user names and passwords). These “hackers” are usually not humans sitting at keyboards, typing names and passwords, but rather automated systems (e.g. scripts) which scan the Internet looking for systems with user accounts with guessable credentials and/or known vulnerabilities in their system software. Sort of like a modern version of “War Dialing”. The truth is, if one of these scripts successfully logged into your BBS as “root” or “admin” or whatever, they wouldn't know what to do: These scripts are most likely expecting to encounter some kind of Unix shell prompt with which they can further interrogate the system for known vulnerabilities or use the system to launch attacks against other hosts on your local network or the Internet. A Synchronet BBS command shell would not provide a favorable environment to these “hacking” scripts, but they don't know that, so they will just continue to blindly probe your ports and rattle your doorknobs. It may be irritating to some, but it's mostly harmless. One thing these attacks can do, though it's usually not their intention, is to tie up your BBS's resources (e.g. Terminal Server nodes for Telnet, RLogin, SSH connections and logins). If you find that your Terminal Server's nodes all are being occupied by “hackers” attempting brute-force logins (or just sitting stupidly idle until disconnected due to inactivity), you can mitigate this problem by setting the MaxConcurrentConnections value in the [BBS] section of your ctrl/sbbs.ini file to a non-zero value which is fewer than the number of BBS nodes you have setup in SCFG. For example, if you have 4 nodes configured in SCFG, then you might want to limit the maximum concurrent connections (from the same client IP address) to 2 (e.g. MaxConcurrentConnections=2). IP addresses listed in your ctrl/ipfilter_exempt.cfg file are not connection-limited. Clients that are successfully logged into your BBS do not count against the concurrent-connections limit, if one is configured. The default configuration (in ctrl/sbbs.ini) contains no concurrent-connections limit (i.e. MaxConcurrentConnections=0). This protection mechanism was introduced in Synchronet v3.17 (November, 2016). Synchronet normally disallows the use of common passwords by users (see the text/password.can file) and system operator accounts are protected with a secondary “system password”, so there should be little chance of a dictionary-based login attack actually succeeding. You can run exec/badpasswords.js (e.g. using jsexec) to check your user database for common passwords if you wish. Synchronet also disallows the use of common administrative user login names (e.g. root, admin). This is accomplished through the text/name.can file. … to numbers you are comfortable with. 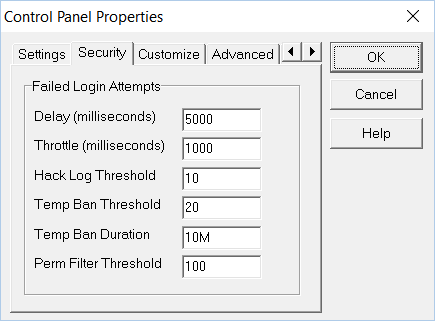 The default temporary ban Threshold is 20 (failed login attempts) while the default temporary ban duration is 10 minutes. Note: Setting the Temp Ban Threshold to 0 will disable temporary bans based on failed login attempt counters, but a failed login with a blocked name (from text/name.can) will still result in an immediate temporary ban, regardless of the Temp Ban Threshold value. … to a number you are comfortable with. I do not suggest setting this value lower than 10 so that you do not filter the IP address of valid BBS users who simply forgot their password. You may wish to warn your BBS users that they should not repeatedly attempt invalid passwords or their IP address may be automatically blocked by your system. The default Filter Threshold value is 0 (disabled). Note: These LoginAttempt values may be set in your sbbs.ini to different values for each Synchronet server/service if you wish, but that's a configuration that most sysops won't need. See sbbs.ini for a list of all the failed-login-attempt related configuration settings available.